Together: with God, each other, and all creation. Building RELATIONSHIPS is WHY we do what we do: with God, with each other, and with creation. When we live TOGETHER in intentional Christian community, even for only one week, we gain person-to-person relationship skills to benefit our families, schools, churches, communities, nation, and world. We try to be living examples of Jesus’ ministry of life, hope, and unconditional love. Likewise, your camper will enjoy their week with excellent counselors and with campers who have different backgrounds, gifts, and abilities. 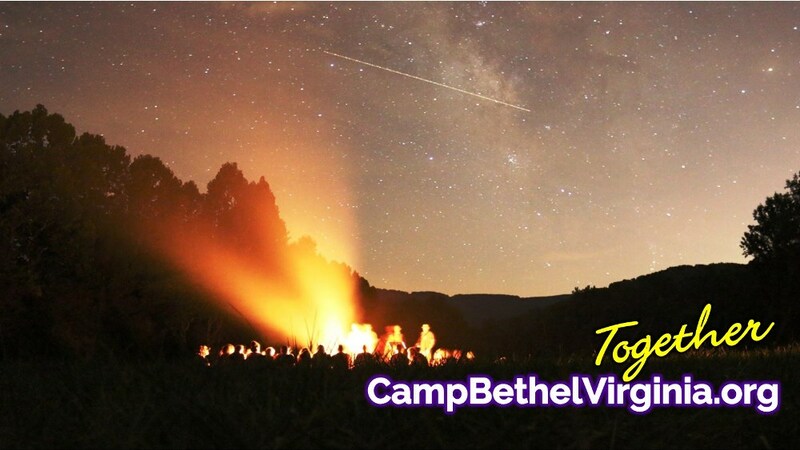 Our Mission: Camp Bethel is the outdoor ministry of the Virlina District Church of the Brethren that exists to foster and build relationships with God, with each other, and with all of God's creation, TOGETHER. We live this ministry through our summer camps, our services, and availability of our facilities to people of all denominations and backgrounds. Our Site and Property: Camp Bethel is 470 sacred acres of forests, fields, ponds, streams and hills in Botetourt County. Our property connects to the vast Jefferson National Forest and a 3-mile trail-hike up through Horseshoe Bend to the Appalachian Trail. Camp Bethel programs began at this location in 1927. Camp Bethel is open all year for conferences, retreats, festivals, school groups, outdoor education, and other family, church and community events. Our facilities are a mix of modern rustic-elegant cottages, lodges, meeting rooms and event spaces. Supportive congregations, loving guests, faithful families and campers, exceptional food services, a Biblically-based program philosophy, excellent staff, and hundreds of devoted volunteers have established Camp Bethel as the region’s best camp. In small groups of 10-12 campers and 2-4 counselors (cabins separated by gender), campers play and learn together in an intentional Christian community as the Body of Christ (1 Corinthians 12). Trained counselors lead hundreds of active, fun, educational activities. Through these experiences, with Jesus as our hope, campers come to understand that their relationships with each other and all creation are precious to God and worthy of our active care. Quality and Safety: We voluntarily follow 300 health, safety and program quality standards covering every facet of our operation: site and food services; transportation; health and wellness; human resources and staffing; program design and activities; aquatics; adventures and trips. Camp Bethel is committed to providing a safe, nurturing camp community; caring, professional counselors and staff; developmentally appropriate experiences; opportunities for service, leadership and personal growth; experiential education; and opportunities for discovery. Our policies and practices create a conducive environment for child and youth development. We strive for excellence in all we do, and we invest in accreditation because you deserve our best. We are proud of 92 years of excellence at Camp Bethel! The Virlina District is one of twenty-four districts of the Church of the Brethren denomination and encompasses 93 congregations, fellowships and meeting points with 10,346 members located in Virginia, West Virginia, and North Carolina (hence, "Vir-lina"). The members of these Virlina District congregations own and operate Camp Bethel TOGETHER by electing a volunteer District Board and Outdoor Ministries Committee, through their volunteerism in service and work, and their gifts and tithes. The Church of the Brethren is a denomination of 112,656 members in 1,026 congregations, fellowships and projects throughout the United States. The Church of the Brethren is a Christian church similar to other mainstream Protestant groups such as Methodists, Baptists and Presbyterians. Brethren are noted for an emphasis on peacemaking, reconciliation and service. We base our beliefs on Jesus’ life and teachings and the New Testament. Jesus saved the world by serving its people, so we seek to do the same. Our other distinctions include our peace position (Matthew 5:44) (shared with Quakers, Mennonites, Amish, and Moravians), emphasis on simple living (Romans 12:2) and Christian service (Luke 22:27), feet-washing during Communion worship service (John 13), and baptism by choice (Acts 2:37-39). The name “Church of the Brethren” was chosen in 1908 to emphasize a sense of family and community. The Church of the Brethren views all people as children of God. Related denominations, formed through mission work, are found in Nigeria, India and other nations. Brethren began in Germany in 1708 as a movement advocating adult profession of faith and baptism by immersion, separation of church and state, and an earnest desire to live out the teachings and example of Jesus Christ.